By February, KFC announces tests are ongoing for its mobile ordering service. This could account for ten percent of total sales, giving consumers a peek into the future of retail. A little more than a month after, KFC UK & Ireland unveiled ‘KFC Fast Track’ — first ever of its kind to offer ordering and payment via web and mobile app. Initially, this is now available in UK, in ten KFC restaurants. Current iPhone users can make the most of this app; web app is expected to follow pretty soon. This novel app utilized AIRTAG’s Airshop Solution, a comprehensive package making mobile payments and ordering based apps possible for retailers. 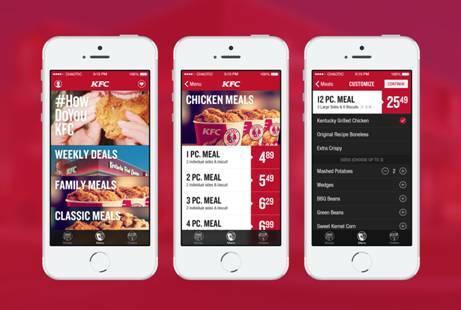 KFC food lovers can now order and pay using mobile ordering solution. And more, app also offers more convenience: order history, a store locator and even a one-click payment support. Once in one’s selected KFC store, users just have to check in via mobile, alerting a KFC staff in the process. This allows a user to skip the usual line and proceed straight to a checkout counter — exclusive for KFC Fast Track users. In the not-so-distant future, a more advanced feature labelled as geofencing will be available, making users check-in even before arrival. The clamor for mobile ordering technology was reaffirmed in recent National Restaurant Association (NRA) by both exhibitor and attendees who were on a consensus: Mobile ordering is poised to transform the industry. Recent moves by NCR Corporation teaming up with LevelUp are strong indications of this trend. The project: Bring LevelUp’s mobile payment/loyalty solutions into NCR’s restaurant POS systems. With 100,000 NCR base locations nationwide, huge is an understatement for this project. Another enterprise, Heartland Payment Solutions, has decided to team up with LevelUp recently. This technology signals a possible tsunami wave in the future, ideally bringing in more comforts to consumers. Current KFC UK & Ireland IT director, Paul Borrett, underscores the “increasingly busy lives” of consumers. Further, he stipulates that KFC will be “closely working” with AIRTAG — making greater innovative features possible from the KFC Fast Track. Technically, this should transform the traditional buying routine into a more comfortable experience: ordering, paying up and the eventual collection of the goodies.